Different solutions for you and your customers. Every day, Europcar optimizes relationships with travel agents by establishing clear pricing structures, delivering an outstanding quality of service and providing effective reservation channels. 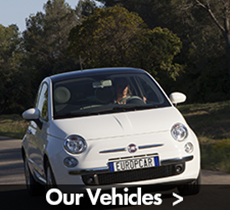 Become a partner of Europcar? Present since 1994 in the GDS (Global Distribution Systems), Europcar has developed its activities in the world of tourism by making available booking site dedicated to travel agencies and so allowing them to improve their own website interfaces. Please fill in and send the contact form.